Nature has a way of teaching us things we really do know but have forgotten. On my morning walk I came across this magnolia blossom and it reminded be how beautiful we all are, without trying to be or even thinking about it. 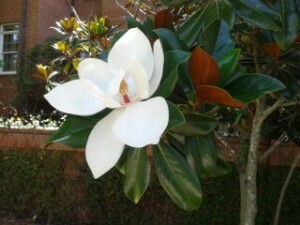 A magnolia blossom doesn’t have a mirror, makeup, a hot date, or an appointment to be any where. The blossom just shows up… in all of her magnificent beauty. Not to impress but because that is just who she is. Happiness Here, Happiness NowWhat are you Bringing?